The Metropolitan Division was the NHL’s most competitive division last season and the movement leading up to and through the NHL’s two days in Chicago certainly proved that the arms race between those eight clubs as New Jersey and Philadelphia owned the top two selections and added major pieces, while the Rangers, Islanders, Blue Jackets, and Penguins all swung major trades to significantly shift their outlooks for the 2017-18 season. Let’s take a look to see what each time did. The suspense leading up to Devil’s general manager Ray Shero taking the stage was palpable. The big question for months had been which center he was going to select and what would it say about the direction he had planned for the organization going forward. Would it be the big rangy center from Brandon in Nolan Patrick? 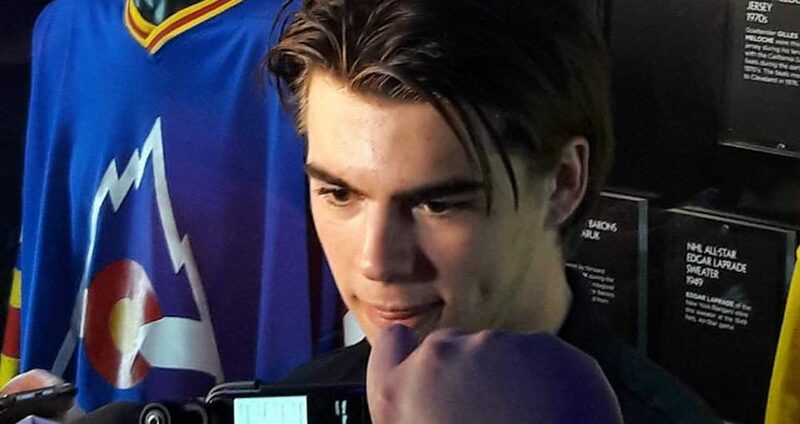 Or would it be the fleet footed and minded Swiss center from Halifax in Nico Hischier? Shero leaned into the microphone. “With the first pick of the 2017 NHL Draft, the New Jersey Devils are proud to select…from the Halifax Mooseheads: Nico Hischier (feature photo). The Devils did two things in this draft: they had a distinct European focus and they chose to diversify their center portfolio when they selected Hischier over Patrick. Hischier presents the ultimate change of pace from big centers in Adam Henrique and recently drafted Pavel Zacha and Michael McLeod. He plays fast and that’s the style of play that Shero was looking for. He possesses the ability to change speed and dictate play as he wants it. He has the ability to make the proverbial play out of a phone booth in tight quarters and is an able and willing defender coming back on plays. Still has some pro weight to put on (178lbs as of the Draft Combine), but he’ll have a spot on the Devils come October. Becoming the highest drafted player to come out of Switzerland was a source of pride for Hischier. Shero also did very well in getting Jesper Boqvist in the second round (and was a particular favorite of mine coming into the Draft). Possessing the versatility to play center and wing, he has a quick release on his shot. He’s already playing against pro level competition with Timra in the SHL with the only major knock on his game being the defensive side, which is why he fell to the second round. Smith is committed to play at Harvard in the fall. The selection of big Russian winger Nikita Popugaev was a shrewd move. The good: tremendous size with an excellent shot. The bad: questions about his effort following a trade from WHL Moose Jaw to Prince George. That said, as a fourth round pick, he presents your classic boom or bust pick. The Devils rounded out their draft picking goalie Gilles Senn (129th overall), forward Marian Studenic (143rd overall, center Aarne Talvitie (160th overall), defensemen Jocktan Chaney (191st), Yegor Zaistev (205th) and Matthew Hellickson (214th). After the Devils made their selection of Hischier, Flyers GM Ron Hextall wasted little time stepping to the microphone and announced Philadelphia’s selection: Brandon Wheat Kings center Nolan Patrick. Patrick (pictured above) entered the 2016-17 season as the prohibitive favorite to go first overall, but due to injury concerns which limited him to 33 games, he saw Hischier overtake him with an explosive first season in North America for the QMJHL Halifax Mooseheads. It was a fact that didn’t seem to concern though, even after his recent medical check in Philadelphia. Patrick provides Philadelphia with a blue chip prospect that many draft pundits believe will make the team’s roster out of training camp this fall. Possessing pro ready size at 6’2, 198lbs, he has strong NHL bloodlines through his father Stephen, who was a first round draft pick of the Buffalo Sabres (20th overall in 1980) and his uncle James who played 21 years in the league as a defenseman. While it’s very likely that Patrick will be on the Flyers opening night roster, the Flyers GM had an additional message. The best word to describe Hextall’s approach following his selection of Patrick with the second overall pick: aggressive. As the first round wound to a close and the St. Louis Blues’ pick, the Flyers sent forward Brayden Schenn to the Blues in exchange for forward Jori Lehtera, the 27th overall pick, and a conditional first round pick in 2018. They used the pick to select quick and aggressive forward Morgan Frost. How would Frost describe himself? Not bashfully. As day 2 began, Hextall was again aggressive in targeting 6-6, 200lb forward Isaac Ratcliffe at pick #35 in exchange for the 44th pick, the 75th pick, & a fourth round pick. “I’m a big guy, I can play both offensively and defensively. I play in all areas. I think I can bring a lot to the table,” Ratcliffe said. 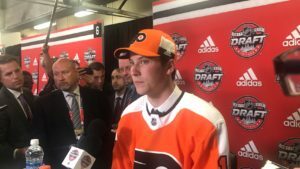 Trading three picks for one is bound to raise eyebrows, but Ratcliffe had first round grades from many draft pundits, and not unlike when Hextall traded up in 2015 to select Travis Konecny, the same aggression was shown in getting him. Hextall would draft Russian goaltender Kirill Ustimenko with the 80th pick. Ustimenko had impressive numbers playing against MHL competition for St. Petersburg. In the fourth and fifth rounds, Hextall went for boom or bust selections in Kingston’s Matthew Strome and Owen Sound’s Maksim Sushko, along with Minnesota high schooler Noah Cates in Round Five. The Flyers capped their draft by picking smallish forward Olle Lycksell and overage defenseman Wyatt Kalyniuk. Philadelphia started their draft with 11 picks and ended up with nine selections, while adding a few more for the next draft. GM Garth Snow made a pair of major deals, one before the draft and another during Day 2. He sent RW Ryan Strome to the Edmonton Oilers for Jordan Eberle. Eberle is a consistent point producer and figures to slot alongside John Tavares. His second deal had shipped defenseman Travis Hamonic to the Calgary Flames in exchange for a 2018 first round pick and two second round picks. There’s been some discussion that some of that return could be used in a trade to acquire the Avalanche’s Matt Duchene, who would a perfect complimentary piece to Tavares. With no first round pick in this year’s draft, Snow focused on getting prospect defenseman and selected Finnish defenseman Robin Salo (pictured below) with pick #46. 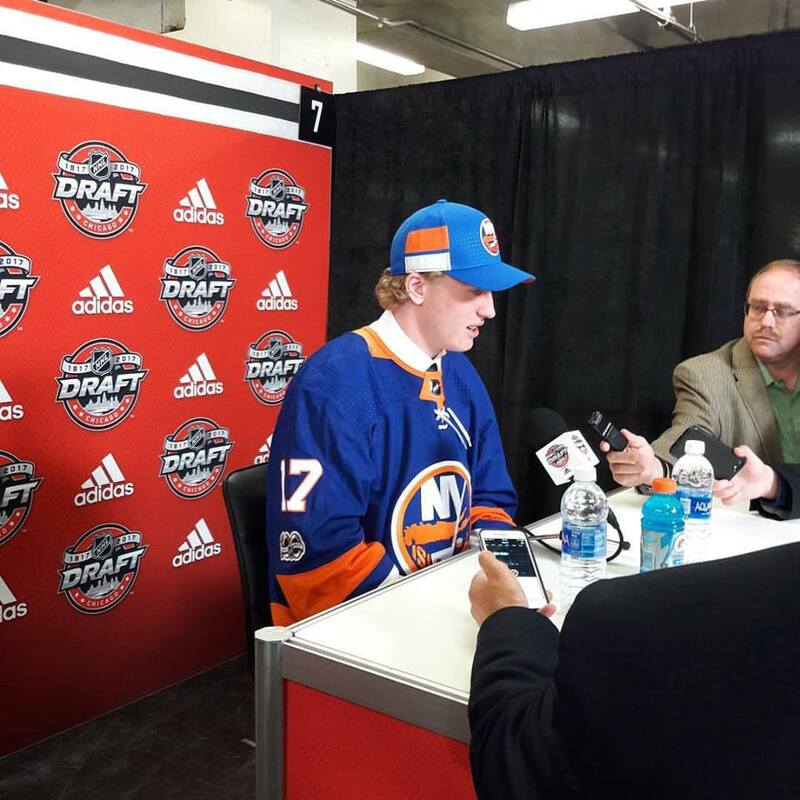 Good size and some whispered comparisons to Miro Heiskanen during the draft, which the Islanders would love. How would Salo characterize his game? Salo idolizes now Arizona Coyotes defenseman Nicklas Hjalmarsson. He followed that up with the #60 selection of Chicago Steel (USHL) defenseman Benjamin Mirageas and in the fourth round took Swedish defenseman Sebastien Aho (no relation to the Hurricanes’ forward). 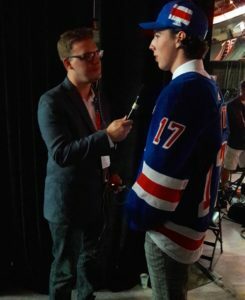 The Isles wrapped up their draft with a pair of LW’s in Arnaud Durandeau and Logan Cockerill. Leave it to Jarmo Kekkalainen to make some serious noise prior to the draft, sending Brandon Saad back to the Chicago Blackhawks in exchange for former Calder Trophy winner Artemi Panarin, and then moved prospect Keegan Kolesar to Vegas to move up to #45 and get their top selection in the draft: French forward Alex Texier, who is well regarded for his quick release on shots and instincts in the offensive zone. Beyond that, they brought in goaltender Daniil Tarasov. He’s a 6-foot-4, 181-pound netminder from Novokuznetsk, Russia and a player with connections to Jackets’ goalie Sergei Bobrovsky. They followed that pick with center Emil Bemstrom, of Sweden, at No. 117, and center Kale Howarth, of Canada, at No. 148. General Manager Scott Gorton set the Rangers up for draft day with two first round picks, the higher of which (seventh) was acquired from the Arizona Coyotes, along with defensive prospect Anthony DeAngelo in exchange for center Derek Stepan and goalie Antti Raanta. With the seventh pick, the Rangers took forward Lias Andersson, a bit of a jack of all trades who played at second line center for SHL champion HV-71 showing a strong puck possession game. They followed that pick with speedy Czech forward Filip Chytil (pictured below) who is patient in handling the puck and waiting for opportunities to make plays. The Rangers didn’t pick again until the fourth round when they took London Knights defenseman Brandon Crawley, a physically mature defensive defenseman who isn’t going to put up Erik Karlsson numbers. New York selected agitator type Dominink Lakatos in the sixth round and forwards Morgan Barron and Patrick Virtu in the seventh round. Jim Rutherford shook up things at the tail end of the first round, shipping forward Oskar Sundqvist and the #31 pick to St. Louis for enforcer Ryan Reaves and the #51 pick. The Penguins made the trade from a need to protect Sidney Crosby and other star players in their lineup as they look to three peat this season..
With their newly acquired pick, Rutherford selected defenseman Zachary Lauzon (pictured below). In the third round, Rutherford continued to address defense with his pick of Clayton Phillips 93rd overall). 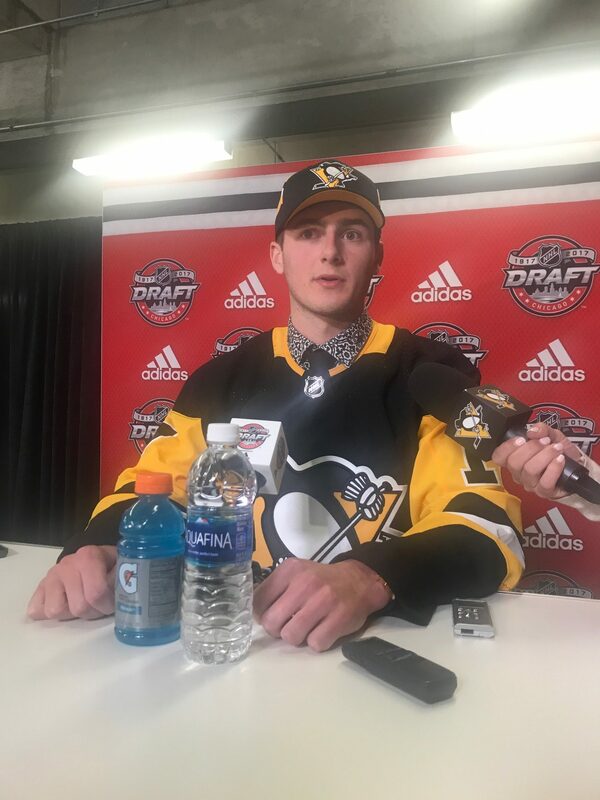 They were joined in the Penguins’ draft class by winger Jan Drozg (5th round, 152nd overall), center Linus Olund (5th round, 155th overall) and defensemen Antti Palojarvi (6th round, 186th overall) and William Reilly (7th round, 217th overall). Through a variety of trades, the Capitals were left without a pick in the first three rounds. They made most of their noise earlier that day, when they shipped draft choices in an attempt to “win now,” as evidenced by the Caps bringing back T.J. Oshie on an eight year contract. The Capitals made a conscious effort to stock up on blue line prospects for their future, drafting Swis defenseman Tobias Geisser in the fourth round, Swedish left-shot defenseman Sebastian Walfridsson with pick No. 151 in the fifth round and right-shot American defenseman Benton Maass in the sixth round with the 182nd pick. The Capitals took forward Kristian Roykas-Marthinsen with their last selection of the draft in the seventh round. GM Ron Francis’s draft focused on adding playmaking pivots in the first two rounds The selection of Martin Necas gives the Hurricanes a swift playmaking center with whispers of Ottawa’s Kyle Turris in his game, while Finnish second round pick Eetu Luostarinen brings physical maturity and a solid two-way game. Big collegiate defenseman Luke Martin (6’3, 200lbs) from the University of Michigan was a good value who projects as a solid all around defenseman, while Tri City’s Morgan Geekie also provides a responsible 200 foot game. The addition of Portland Winterhawks defenseman Brenden de Jong (6’5, 195lb) late was intriguing. Seems like the order of the first two picks was determined less by Patrick’s health (as a lot of pundits seemed to feel He was a risk because of it) and more by the Devils desire to add some speed. I wonder if the Devils and Flyers switched places, would Patrick have gone #1? Looking at the rest of the draft, the Flyers took a lot of size at forward, which makes sense because they are a small team, on average. However, Hischier has something the Flyers are also lacking: speed. Either way, jumping 11 spots was almost a miracle. The future is bright. Morgan Frost is the speed. At the Top Prospects Game testing in CHL he finished first in the 30M sprints with and without the puck. Apparently was said to be second fastest skater in the draft. Flyers did have smallest team in league last year but the guys coming up soon are very large. Lindblom 6’2, Patrick 6’2, Morin 6’7, Hagg 6’2, Sanheim 6’4, Myers 6’5, Rubstov 6’1. In 3 years we may go from smallest team to largest. Very exciting stuff.